“Messages from the wall” is the title of the exhibition of posters from 1886-1975 shown at the Bilbao Fine Arts Museum between 6 October 2015 and 18 January 2016. 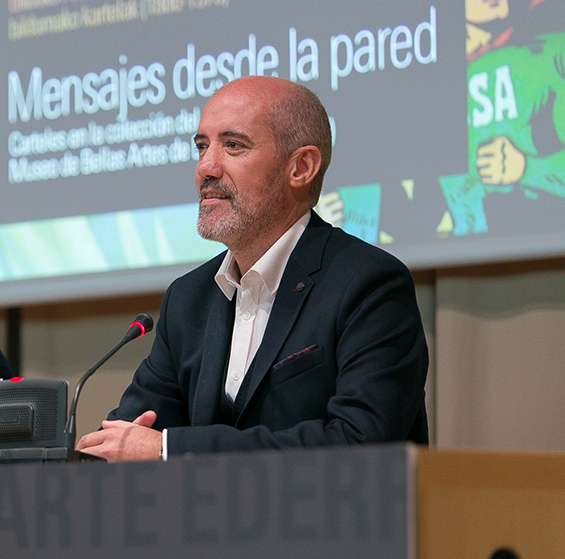 Mikel Bilbao, a professor from the Department of the History of Art and Music at the University of the Basque Country (UPV/EHU) and the Dean of the Faculty of Fine Arts, was the curator responsible for designing and organising the exhibition project. 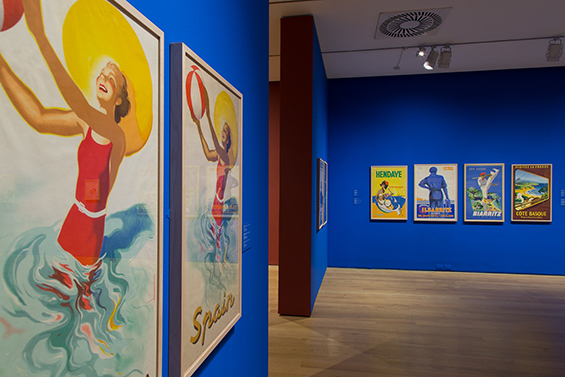 The exhibition showed a selection of 225 posters in 7 themed blocks relating to different types of posters:tourism, bullfighting, commercial, sports, politics/war, entertainment and exhibitions/trade fairs/conferences.The quality of the artists and the variety of the works were the main criteria for a selection that resulted in around 45% of the collection being displayed.Having different themes in each room made it possible to exhibit an extremely high number of posters, which is not common in exhibitions of this kind, as it is difficult to hold people's interest with over a hundred pieces.More than 50,000 people visited the exhibition, which was well received. For more than 3 years, Mikel completed the basic cataloguing of the posters that the museum had begun and tried to clearly establish the date of the more difficult posters and their history.This work requires you to consult newspaper archives, trademark gazettes and other sources, including personal sources.It is a task that has become much easier today but which is still a lot of hard work. Mikel keeps information about each of the posters on a database, including appearances in the press and other records relating to the history of the poster, the product it advertises and the advertising company.A small fraction of this database was used to prepare the catalogue for the exhibition:an A4-size book with 400 full colour pages, including around 200 containing explanatory text.As it is a collection that cannot be exhibited permanently, the catalogue will serve as a reference and reminder. Also, as this was an in-house production by the Bilbao Fine Arts Museum, it is possible that we may see the exhibition in other cities in coming years. Why did the Museum hire a curator from the university? “Although the catalogue is written to appeal to a wide audience, the information that it contains has the rigour of a finding from scientific research”, remarked Mikel, who wrote the initial draft of what would finally become the exhibition 3 years ago. Additionally, this work is also reflected in the classrooms, as Mikel teaches classes on the General History of Design, where graphic design and many of the posters from the exhibition are studied. But the benefits of the dissemination activities that put the researcher in contact with society also work the other way.This was the case with one of the posters, for which there was very little biographical information about the artist, so it was exhibited with certain gaps in the accompanying text.Previously, Mikel had unsuccessfully tried to get in touch with the artist’s son for over a year.As a result of the exhibition, it was the son of the poster artist who contacted Mikel to fill in the gaps in his research, after seeing his father’s work.